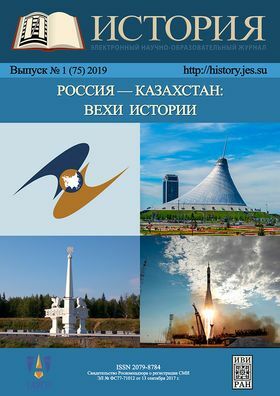 The “Russia and Kazakhstan: Milestones of History” special issue is dedicated to various aspects of the history of two neighboring countries tracing back into the deep past. Over centuries the peoples of these nations were tied by relations of good neighbood. This issue is the first tentative result of academic work of the Joint Working Group of historians from the Russian Federation and the Republic of Kazakhstan, established in 2018. The articles of Russian and Kazakhstan historians, archeologists, archivists, orientalists, anthropologists, political sociologists from the leading research institutes and universities from Moscow, Astana, Saint-Petersburg, Almaty, Orenburg, Omsk, Novosibirsk and Barnaul represent the current research of the most vital themes in the sphere of the history of Kazakhstan and Russian-Kazakhstani relations in historical perspective. The issue also presents a view on the entangled history of Russia and Kazakhstan by leading Western European experts. The main idea of this issue intented to establish a meeting point for constructive scholarly discussion and to reveal promising new topics of joint research both on the bilateral and wider — trans-regional multilateral basis. The issue is built upon a chronological principle: most articles are multidisciplinary and comprise the period from archeological cultures of VI—I centuries B.C. to the current developments in the Russian Federation and the Republic of Kazakhstan. Among them a reader would find an overwiev article (M. Abuseitova), archeological study which include the results of the latest joint expeditions and excavations (L. Kraeva, E. Zilivinskaya); diplomatic history (B. Ayagan, E. Pivovar, A. Guschin, A. Levchenkov, I. Khanova, R. Pochekaev, Z. Kabuldinov); source studies (I. Zaitsev), historiography of various periods of shared history (N. Lapin); anthropological and ethnological history (Sh. Akhmetova, А. Ilyina, L. Petrich); historical psychology and biographical studies (Z. Djandosova); social and cultural history (А. Morrison, D. Vasiliev, Yu. Lysenko, V. Khristoforov, Yu. Guseva, Е. Larina, S. Kovalskaya, S. Lubichankovskiy, А. Seleznev, I. Selezneva, А. Ulunian, M. Shilovskiy); legal history (B. Ayagan, А. Aunasova, E. Nurpeisov); economic history (Yu. Tsyriapkina); history of public administration (Т. Kotyukova, D. Amanzholova, А. Kadyrbaev), political sociology (А. Kuznetsov, D. Malysheva). The opinions of the Editorial Board may differ from those expressed in the articles.